Full disclosure part I: a month ago, while on my way to a business meeting, I saw a few OWS folks “camping” in front of the Federal Reserve Bank on Market street in San Francisco. I did not even have the time to take a picture with my iPhone, let alone chat with someone. This is the closest I ever got to touching, or being touched, by anyone in the movement. Our financial system is badly broken. Rather than letting it continue with business as usual, the Federal Reserve Bank should take over the banking system. Many of the services provided today by banks can be provided (once the Fed takes over) through devices such as iPhone just as they do in rural India. Substitutes could and should be developed for the services that can’t be carried out through iPhones or similar devices. Developing such services is no different from developing alternative sources of energy or health care services. Once the government puts in the appropriate policies (to encourage development of such services), a ton of entrepreneurs will jump at the opportunity. I have no doubt that there are zillion details that I am not aware of that need to be figured out. I am a software engineer, not a banker. But, I believe that at a very high level bullets 1-6 above capture some aspects of the message folks in the Occupy Wall Street movement are trying to get across. Hence, I am really surprised at the question I see cited so often “But what do they really want? !” IMHO they simply want a major reform of the financial system. The details for so doing are better left to experts. Full disclosure part II: I have to admit my blood boiled today when I saw the videos from UC Davis. As I said in a tweet an hour or so ago, it starts feeling like the brutality inflicted on the Bonus Army in 1932. Tim O’Reilly goes one step further in his post in which he brings up the loaded topic of Banality of Evil. So, I might be writing this post with some strong emotions. But, I think the thesis I pose is directionally correct. You don’t need to take my word for it. Just read Technological Revolutions and Financial Capital by Carlota Perez. Any department/business unit that can get a service in entirety from an outside source is likely to do so without worrying about enterprise software and/or data center considerations. This is already happening in Marketing. As other functions start doing so, more and more links in the value chain of enterprise software will be “consumerized.” In other words, these services will be carried out without the involvement of the IT department. Once the switch-over costs from legacy code to state-of-the-art code are less than the steady state costs (to maintain and update legacy code), the “consumerization” of enterprise software is going to happen with ferocious urgency. In this post I would like to add a third factor – the buying pattern. My contention is that the buying pattern for micro-apps will spread to enterprise application. Potential demand for buying in this way is huge. Supply for buying enterprise software as micros-apps is not quite there yet, but it would take only one smart vendor to start transforming the traditional pattern how enterprise software is chunked, offered and sold. Think about your recent experience downloading an application to your smart mobile phone. You did not go through a six-month evaluation period; you did not do a comprehensive competitive analysis; you did not check how well the seller does customer support in Sumatra. You simply paid something like $7.99 and downloaded the application. You are more than happy if it fulfills your needs in a reasonable manner. If it does not, you simply buy another application with the functionality you desire. Maybe you are a little more cautious now and ask a friend or send an inquiry to your Twitter followers before you pick the new application. Whatever you might choose to do, the fundamental facts are: A) you can afford to lose $7.99; and, B) your time is more precious than the sunk cost of the application. You simply move on. This buying pattern is not something that you are going to forget when you step into your office in the morning. It makes perfect sense to you and it would be good for your company. You would rather concentrate on your business than on the tricky language of clause number 734 in the contract that your department’s attorney prepared for licensing yet another piece of enterprise software. The ‘$7.99 experience’ you and zillion other folks like you had over the past week or the past month makes enterprise software vendors extremely vulnerable. The “high-touch; high-margin; high-commitment”  business design is not sustainable once the purchase model changes. The expensive machinery of professional services, system engineering and customer support is not affordable at the face of competition that constructs modular chunks of enterprise software and sells them at a price the customer can afford to write off (if they do not perform to satisfaction). Maybe the ceiling in the enterprise to ‘forget about this application and move on’ is no higher than $1,000 (instead of ‘no higher than $7.99’ for the private citizen), but a smart vendor can still make a lot of money on selling at one thousand dollars a pop to the enterprise. All it takes for this shift to start – in ITSM or in another part of enterprise software – is one successful vendor. I am indebted to Annie Shum for this phrase. I am indebted to Russ Daniels for this phrase. ﻿As indicated in our recent post “Extending the Scope of the Agile Executive”, Cote and I have recently reached the conclusion that The Agile Executive needs to cover structural changes in order to give a forward-looking view to its readers. We start the coverage of structural changes that are relevant to Agile with an interview with Annie Shum, VP of Advanced Technology, Amdocs Corp.
Israel: Nancy Foy immortalized the monolithic International Business Machines Corporation in her classic “The Sun Never Sets on IBM.” Much has changed, of course, since the book was published in the 70’s. For quite a few years IBM has been deconstructing its business design, its organizational structure and both internal and external processes. By some accounts, prior to Gerstner IBM had even been contemplating reforming itself as a bunch of independent companies. The contrast to IBM’s announcement a couple of weeks ago about putting both software and hardware under one hand is noteworthy. What do you make of it, Annie? Is this a new development? Or is it a blast from the past? Annie: Interesting question but I would be remiss if I failed to point out that I don’t have a crystal ball or the expertise to predict reliably whether this will be an isolated case or a trend-setter. Although the arguably radical IBM organizational restructuring in management is newsworthy, I am not especially interested in looking at it purely from the perspective of vendor management structure because it is merely a means to an end. What intrigues me is the rationale behind this key announcement. In particular, I am interested in envisioning the more profound and potentially game-changing, if not disruptive, transformation that IBM hopes to unleash by adopting this bold organizational restructuring with likely (significant) risks. To better understand this new undertaking, I think it would be instructive to analyze it from the supply side as well as the demand side. So let’s break up the narrative: first by looking at the supply side, namely the IT service providers/system vendors, followed by the second half of the narrative, the customers/consumers. Israel: I am intrigued by your supply side/demand side approach. Please elaborate. Annie: To understand the supply side, consider the three major IT vendor announcements made during the week of July 19, 2010. Not as three disparate events. 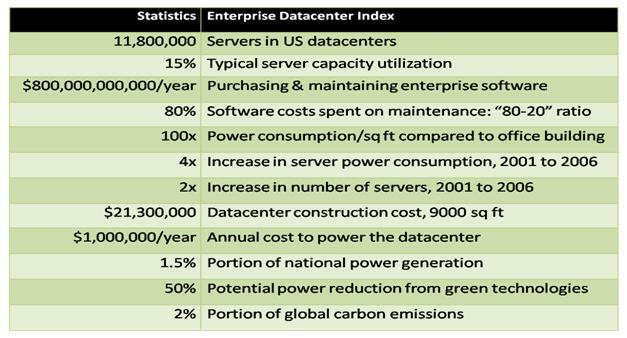 Instead, by putting them in context and connecting the dots among them, we can uncover some very interesting insights into emerging trends of the IT industry in general and actionable guidelines for tomorrow’s enterprise datacenters in particular. To some long-standing industry observers, this strategy may appear to be “back to the future” and IBM is simply returning to its roots after a prolonged hiatus from its original business model. There is, however, an important historical footnote. Almost five decades ago, due to concerns of monopoly antitrust abuses stemming from the bundling of hardware and software in the IBM mainframe systems, the US government took legal action leading to IBM’s acceptance of the 1956 Consent Decree. Today, unlike the past, IBM no longer dominates the computer systems market. In fact, there is a growing trend towards bundled systems, mainly by the “Master Brands”, to “mask” complexity for customers as they embark on implementing complex IT endeavors including key programs such as datacenter consolidation, server/storage virtualization, predictive analytics, SOA/BPM, Cloud Computing (public, private or hybrid), and Green IT. For example, Oracle acquired Sun Microsystems in 2009 for $7.4 billion to support what InformationWeek described as Larry Ellison’s “applications-to-disk” strategy, while HP and Microsoft earlier this year unveiled a multi-million dollar initiative under which they will jointly engineer servers and software. It is likely that the timeline of the July 19 IBM announcement was influenced (perhaps even pressured) by its rivals taking a similar approach to address evolving enterprise datacenters. To expedite this strategy to deliver bundled “plug-and-play” systems, IBM first announced sweeping organizational restructuring to foster internal collaboration and harness synergies across products and LOBs. Clearly, the biggest change is the management restructuring by consolidating key hardware and software divisions under the watch of a single executive, Steve Mills who’s a longtime IBM software chief. Next, just three days later on the heels of this organizational makeover, IBM made another major announcement on July 22, 2010 amidst much fanfare and hype. Presenting the vision of a new “Dimension in Computing” designed to control multi-platform datacenter operational costs and (significantly reduce complexity), IBM announced a new hybrid “system of systems” platform that unifies IT for efficient service delivery and large-scale datacenter simplification. Dubbed a “datacenter in a box” or a “cloud in a box[ii]”, it integrates the new super powerful and energy-efficient mainframe zEnterprise, 196 running z/OS and the zEnterprise BladeCenter Extension zBX, running Linux and AIX. 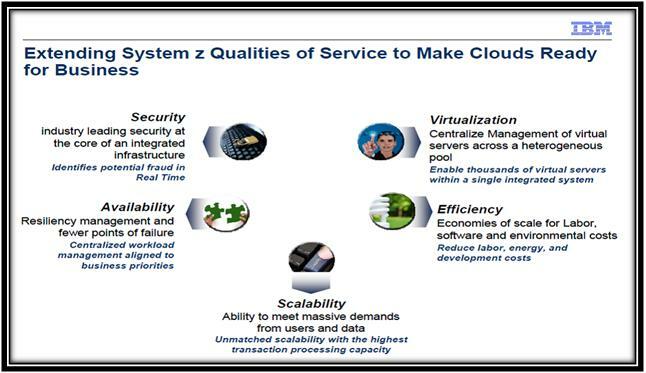 By extending the System Z’s qualities of service (spanning security, scalability, availability, efficiency and virtualization) to enable Cloud readiness and optimized service delivery for enterprises, IBM likely is promoting its strength in building private Clouds for large enterprises. See the following two slides from the IBM July 22 announcement. Annie: Despite these high profile announcements by the major vendors, it is far from fait accompli. And yes, your comments are only too real especially for those who have lived through the era of monopolies and antitrust concerns. Frankly, many people believe that such a trend may be a clear threat in the presently emerging era. While I don’t want to downplay the risk and potential damage of antitrust abuses, I believe there are some factors at work here to counteract, or at least limit, unchecked monopolies in the IT industry. In this Internet age with the rise of “Consumerization of IT”, catalyzed by the nearly ubiquitous access to social networking and other Web 2.0 tools, IT has permeated almost every market sector in our society. The set of functions and services supported and enabled by IT has become exceedingly vast, diverse and complex such that no single business model or supplier is in a position to dominate, let alone destroy all others. The era when a handful of proprietary stalwart vendors dominated the IT industry is all but over. Just this past decade, we have witnessed the meteoric rise of Google, Facebook and more recently, Twitter. A growing formidable force, namely the open source software and its bottom-up self-organizing community, powers as well as empowers most if not all of the Web 2.0 companies. At this point in our discussion, it is apt to segue to the third vendor announcement during the week of July 19, 2010. On July 19, Cloud service provider RackSpace with NASA announced the sponsorship of the project: OpenStack, an open source IaaS Cloud platform. Included in the announcement is a diverse group of computer system providers from across the technology industry like CITRIX, DELL, NTT DATA, RIGHTSCALE and others to drive a deployable, totally open cloud solution. According to their mission statement, OpenStack is designed to foster the emergence of technology standards and Cloud interoperability. One of the primary objectives is to facilitate enterprises to avoid vendor lock-in. Israel: This appears to be a very timely announcement given that “vendor lock-in” is one of the top concerns confronting enterprises as they evaluate and plan for the transition to Cloud Computing. Having said that, are we not back to “square zero” – striking a balance between openness and “one-stop shopping” tight integration? Annie: Yes indeed. Although some industry observers describe the issue as “vendor lock-in”, others see it as a broader issue describing it as the “challenge/difficulty of bringing back in-house” or the “lack of interoperability standards for seamless portability”. 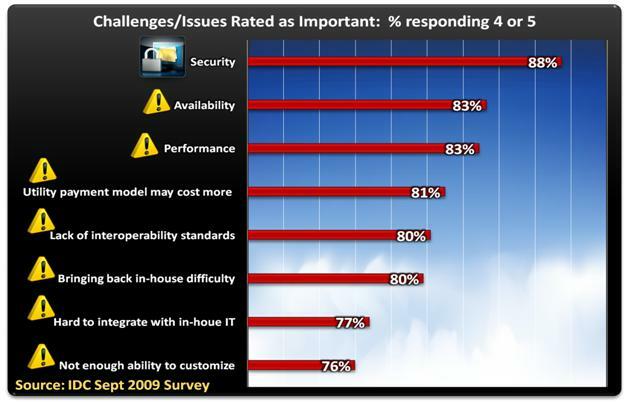 For example, in the 2009 Cloud Computing survey conducted by IDC, over 80% surveyed rated this issue under both labels to be very important. Incidentally, I should point out that “vendor lock-in” is neither a new nor a unique issue with Cloud Computing. On the contrary, it is a long-standing “problem” going all the way back from the early days of mainframe computing and culminating with the government versus IBM antitrust lawsuit in the ‘50s as we discussed earlier. Sorry we digressed. So let’s resume our discussion of the recent major announcements. In a nutshell, the OpenStack announcement attempts to address the issue directly by allowing any organization to create and offer Cloud Computing capabilities using open source software freely available under the Apache 2.0 license running on standard hardware. Now this gets interesting: a tale of two diametrically opposite strategies. On one hand, we have IBM announcing the high performance zEnterprise 196 as a hybrid integrated multi-architecture “datacenter /Cloud in a box”. The goal is to mask complexity and maximize efficiency: infrastructure (management /admin costs savings up to 70%) and energy consumption (up to 82% energy usage reduction) with a bundled technology stack: integrating multi-platforms, infrastructure and management (spanning service, platform and hardware). A principal concern of this proprietary single vendor approach is the risk of “vendor lock-in”. On the other hand, the OpenStack is “DIY” based on an open source development platform. The goal of OpenStack is the following: “Anyone can run it, build on it, or submit changes back to the project. We strongly believe that an open development model is the only way to foster badly-needed cloud standards, remove the fear of proprietary lock-in for cloud customers, and create a large ecosystem that spans Cloud providers.” The cons/challenges of this approach are probably similar to conventional “DIY” open source projects. I should clarify that this dichotomy may be seen as an entire spectrum. As noted here IBM, VMware, etc on one hand, and RackSpace, Eucalyptus, etc on the other hand, exemplify the two end-points bookending the dichotomy spectrum. Along the spectrum, there are a growing number of intermediate options/offerings (with a rising number of variations) by a wide variety of IT Cloud service vendors: stalwart vendors including Amazon, Microsoft, Google, Salesforce.com, etc as well as young companies and startups such as RackSpace, RightScale, Boomi, Canonical, Cloudkick, Opscode, etc. Israel: Is this shaping up to be a battle between two diametrically opposite strategies? And if so, which one will come out on top? Or is it a draw? Annie: To me, a similar dichotomy has already existed previously in the IT industry. For example, think Apple versus Google. Consider the modus operandi of the Apple core business model (“close or at least closely curated” to optimize user experience and quality) versus that of Google’s (“open standards/APIs” to maximize opportunities for 3rd party development participation). Insofar as whether bundled systems or “Cloud in a box” versus open source “DIY” will be the ultimate winner, I have to defer to other industry observers with more experience such as you. Perhaps in our future Q&A meet-up, I am interested to hear your views on how the competition may be settled eventually. However, while we all await the uncertain outcome, IT practitioners should be mindful that the dichotomy spectrum would have profound implications not only on the supply side but also on the demand side. In particular, because the offerings from the dichotomy spectrum will be rapidly evolving, the fluidity will very likely confound and confuse users/consumers as they attempt to balance a convoluted set of different tradeoffs. Many enterprise IT practitioners will be under pressure to make difficult and ambiguous choices by picking one or more evolving offerings over other evolving offerings for building the foundation of tomorrow’s enterprise datacenters in the Cloud era. Israel: Good timing. So far in our Q&A today, you have focused on the first half of the narrative – namely, the supply side, now let’s continue to part 2 of your narrative, namely, the demand side. The advent of Cloud Computing: a long-standing vision whose time may finally arrive. Now consider the following scenario. Suppose enterprise IT could choose an alternative set of “self-service” IT service delivery/deployment models that would be orthogonal to traditional hierarchical command-and-control Cap-ex based datacenters. Instead of owning and tightly controlling its own private internal datacenter and purchasing capital resources up front, an organization on-demand would “rent” pooled computing resources hosted on the provider’s multi-tenant environment. The Internet would serve as the global infrastructure “grid” and all services would be delivered through Web APIs. In lieu of having a dedicated IT staff administering IT operations, users could avoid lengthy red-tape delay and access directly/immediately to provision as well as to manage computing capacity as “self-service IT”. In addition, instead of formal contracts and protracted delay in hardware procurement, an organization would pay for access at any time to “unlimited” computing capacity simply with a credit card. Because there would not be formal contracts imposing preset time commitments, both entry and exit would be friction-free. In this way, an organization could accelerate time-to-value/market and help to catalyze experimentation and innovative endeavor. Furthermore, CIOs of enterprise IT could avoid or mitigate the lose-lose dilemma because they would not be restricted to choosing either a policy that leads to “waste due to over-provisioning” using peak usage estimates for capacity planning or a policy that can incur “risk due to under-provisioning” using non-peak estimates. Ideally, IT staff would “plan capacity based on typical usage” while confident that it could “scale dynamically at peak times” to maintain performance and SLAs. Simply put, the primary objectives for today’s organizations are not just about increasing speed and efficiency for back office automation. Rather, they also are about increasing speed and flexibility to adapt to changes by yielding judicious control to providers for on-demand utility computing services off-premises. Conceptually, this scenario is an overall vision of Cloud Computing. With the advent of Cloud Computing, the vision of “Computing as a Utility” is beginning to take shape. Since the early days of time-sharing computing, that vision has taken a quantum leap towards reality. One of the earliest references to Utility Computing occurred in 1961 at the MIT Centennial. On that occasion, John McCarthy presented his vision of computing organized as a public utility. Just as the telephone system had developed into a major industry, Professor McCarthy envisioned that “Computing as a Utility” could one day become the basis of a new and important public industry. Rooted in the long-standing vision and hope for “Computing as a Utility” that began more than half a century ago, the genesis of Cloud Computing goes back a long way. To a growing number of industry observers, it is an old idea whose time may have finally arrived when, in 2006, Amazon began offering Cloud infrastructure services to the public as a utility. Despite initial skepticism, it was a watershed event in the quest of Utility Computing and helped to usher in the first wave of industrial-strength commercial Cloud Computing offerings. Israel: To wrap up our discussion today, can you leave us with a few thoughts about some of the implications of Cloud Computing as enterprises begin their transition to the Cloud? Annie: Eric Schmidt, Google’s Chairman and Chief Executive has stated that Cloud computing will be “the defining technological shift of our Generation”. However, the media and vendor-spun hype (at times referred to as “cloud-washing”) around this topic has created an unprecedented level of confusion. Today, unabated sound and fury surrounding the Cloud Computing buzz continues and indeed, increases. Nevertheless, it is all but certain that there will be no “big or easy switch” for enterprise IT to transition overnight from running applications on premises to the Cloud. Because the shift is not an “all-or-nothing” or a “one size fits all” endeavor, stakeholders in enterprises should take a judicious measured approach to balance different tradeoffs. To sustain the transition of enterprise IT to the Cloud will require not only technological advances but also new business models, new forms of IT organizational management structure and perhaps even new IT roles. One of the “inconvenient” truths about embracing new user-empowerment technology trends and business models is the slippery slope of finding the “right” balance between hierarchical command-control and bottom-up empowerment. The harm (ineffectiveness and counter-productivity) of too much top-down control can be matched or even surpassed by the dangers of too little control. User empowerment without reasonable constraints can lead to anarchy and chaos. A new form of organizational governance is clearly required to avoid these problems. Striking a balance between planned orderliness and new emergent forces has been a challenging dynamic since the dawn of civilization. Many of the principles that have been refined over the millennia will have direct applicability for governing tomorrow’s world of “self-service” computing in the Cloud. Clearly, there will be direct implications to new scrutiny as well as the shaping/changing of security and governance related policies. However, an organization should not overlook the human aspects and the cultural impact on the IT system administration personnel. For example, resistance to sweeping changes driven by a fear of losing control and the stress over the prospect of losing employment can be one of the more profound ramifications that often are under the management radar. Cloud Computing likely will change the status quo of IT system administration and, perhaps in the future, could obviate the need for some traditional IT system skills. Cloud Computing, however, is also opening new opportunities for the technical IT community and enterprise IT personnel. There is a growing consensus that, as Cloud Computing evolves, the need for more business-minded IT staff will accelerate. Specifically, there likely will be an urgent need for people “with broader business skills who can manage multiple supplier relationships.” Freed from a variety of low-level operational tasks and controls of physical infrastructure via Cloud Computing, enterprise IT has the opportunity to promote system administration staff to higher-level decision makers as IT service facilitators and SLA contracts managers. In the near future, many traditional hierarchical command-control system operators may pursue a wider array of IT professional opportunities spanning the roles of enterprise architects; capacity planning; budget planning; performance assurance; and data, security, governance gatekeepers. Israel: This really resonates with what I see happening in many of my consulting engagements. Successful companies waste an immense amount of capital, energy and management attention on migrating from yesterday’s datacenter to today’s or tomorrow’s datacenter. When exposed to the pains of such migrations, I am always reminded of Peter Drucker’s quip “Companies make shoes!” It is beyond me why companies who makes shoes, cars, drugs or financial instruments would want to be prisoners of their own success, hopping over from one data center to a bigger data center every few years. Annie: Thanks for Peter Drucker’s quip. I am going to borrow it for my future use. Israel: Annie, I can’t thank you enough for sharing your insights with us. You really connect the dots! [i] Based on the assumption that IT infrastructure performance can be greatly enhanced when each element is designed and brought to market as a component of a tightly integrated, optimized system. [ii] With this slogan, IBM is promoting the hybrid zEnterprise 196 integrating multiple architectures and OS in a “box” as the one stop shopping ready-made private Cloud for enterprises. [iii] Information source from IBM, The Open Group Conference, July 22, 2009. Colleague and friend Sebastian Hassinger drew my attention to iBetaTest – a new service that brings together application developers and beta testers. 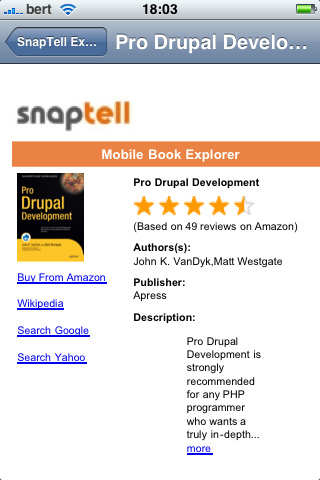 It is a fascinating concept no matter what software development method you use. Once it spreads beyond iPhone applications it could have quite an impact.